Pulikkachal is a spicy, tangy instant rice mix. It is the paste used for making puliyodharai. This is "Neyar Viruppam" from many friends. This is exclusively pulikkachal preparation. Soak 2 lemon sized balls of tamarind in lukewarm water, extract pulp and keep aside. In a heavy bottomed pan, heat gingelly oil, add all the ingredients except the tamarind extract. When they turn golden brown, add the pulp and stir till it becomes like a paste. This is pulikkachal. This can be stored for 2 to 3 months in a refrigerator. Puliyodharai preparation is here. Dry roast pepper, red chillies, coriander seeds, chenna dal and methi seeds and powder it in a mixie. This can be stored in an air-tight container. NOTE: Pulikkachal + the powder mentioned in puliyodharai preparation makes puliyodharai distinct & unique and also enhances the flavour. Shanthiji,I am drooling rite now!! !This is one of my favorites! This is one of my favorite, looks absolutely delicious. Thanks for sharing,my mom used to make the same way too..
Pulikachchal - no words can describe the taste of it. An all time favourite in most of the south indian homes. The pulikachchal looks mouth watering. Very nice...I love your puliyodharai recipe and as you know I made it once and it came out so good! Authentic Iyengar recipe! 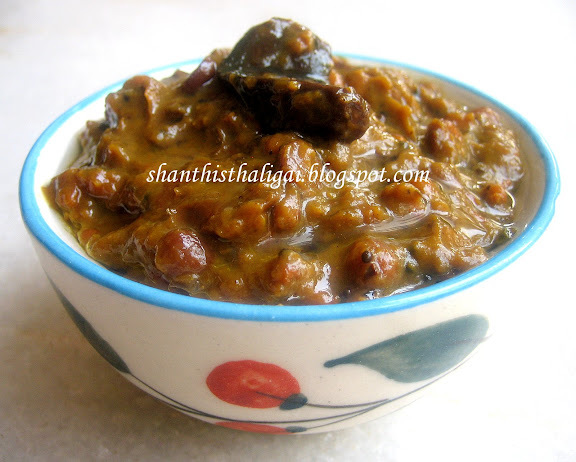 Nice picture of pulikaichal,Its so simple yet flavorful one,i love this like anything! Beautiful recipe, I love Puliyagarai made with this paste. Wow... I love this typical-traditional Iyengar Pulikkachal.. Somehow they taste so different and delicious.. Thank for the recipe Shanthiji!! Lovely, tamarind is such a tempting flavor to me... this must taste amazing! very tasty and spicy one... looks very tempting..
Hello Shanthiji, thanks for visiting my page and there by helping ot find yours. you have a great blog here. this dish is new to me but I love anything with Tamarind and the pungent smell of south Indian Masala mix. am sure this gonna be taste bud tickling. I make it for a week and store in for handy lunches but how to get that distinct taste of the puliodharai given in temples. slurp slurp, makes me mouth water, nice recipe!!! I love your recipes. On pulikkachal I would like you to try my recipe and let me know your liking. I have always recieved kuddos for this recipe and some have said better than Iyengar pulikkachal:) no seriously. Try it. 2 lemon sized ball of tamarind.